Family road trip to the Finger Lakes of NY for a triathlon weekend with Team Z. My hubby and I really enjoyed Musselman weekend last year, so we ensured that we put it on the calendar for this year. We left early on Friday morning for our 7 hour road trip because we had to ensure I registered for my race on Saturday, but most important that my husbnad could register for the Trike bike national champions that took place on Friday evening. Yes, I said Trike bike. We made it just in time for Hubby to register for the race, get to the hotel and get prepared for the Trike Bike nationals (Swim 100 yards, Trike Bike 0.6 miles, and Run 0.2 miles). We arrived at the race site, the race was taken place at 7:00 PM. Racers brought their costumes and Trike bikes; what a scene. C2 and another future Team Z’er P. (18 mos. old) were so excited to see all these bikes that they believed were for them. C2 had a blast playing with them until they called time for the race to start then C2 had a minor melt down because Daddy took his “bike” away. The rules for the bike; a helmet was required and the racers bottoms had to stay on the seats the entire time. This ruined Hubby’s plans to cheat. The race started well for Hubby, but about 50 yards into the bike Hubby dropped out. Unfortunately, the bike really was not moving and Hubby’s legs were hitting the handle bars. But, Hubby joined C2 and me to watch the finish. We saw some very clever ways of cheating. One fellow Team Z’er held the Trike bike to his bottom while he ran around the course; too bad Hubby did not think about that before the race started. A fun evening and now, it was time for me to prepare for my Saturday race. 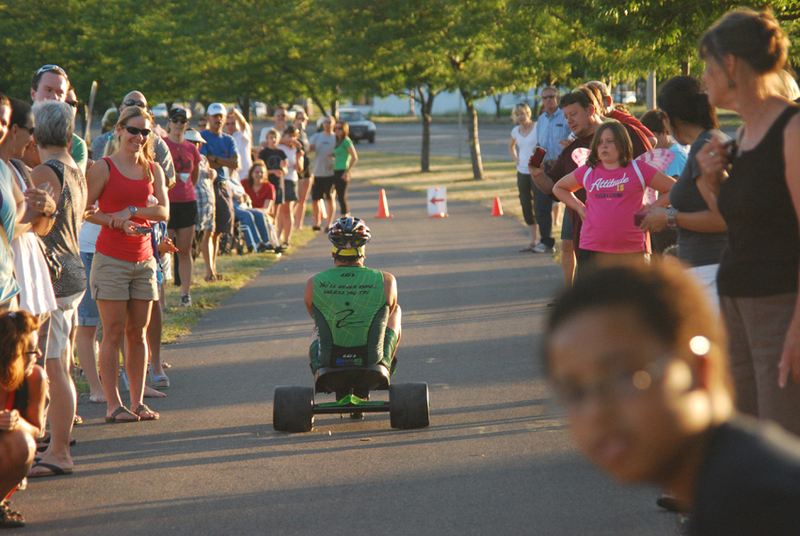 Here is Team Z at the Triathlon Trike Bike Nationals. Our team mate won the national title, check out the video!